I am in Seattle, wake up early and decide to take a morning stroll around the Pike Place Market. 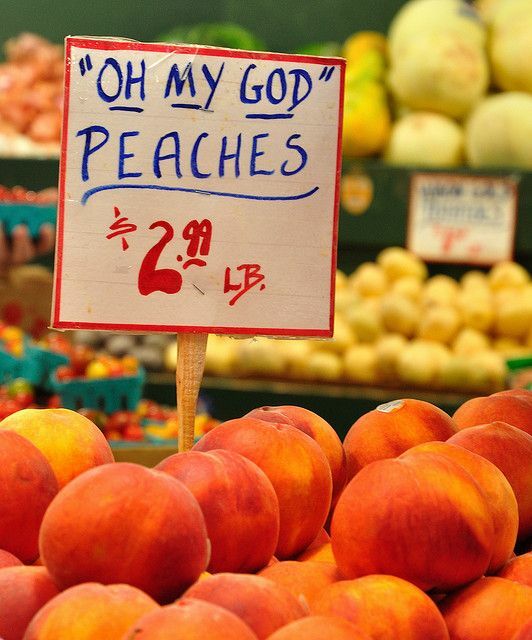 I notice that the produce stalls are bursting with fresh fruit; the peaches look especially ripe and juicy. I consider buying some fruit, but do not want to carry it back to the hotel. However, as I leave the market, I have second thoughts. I just have to sample some of those peaches. 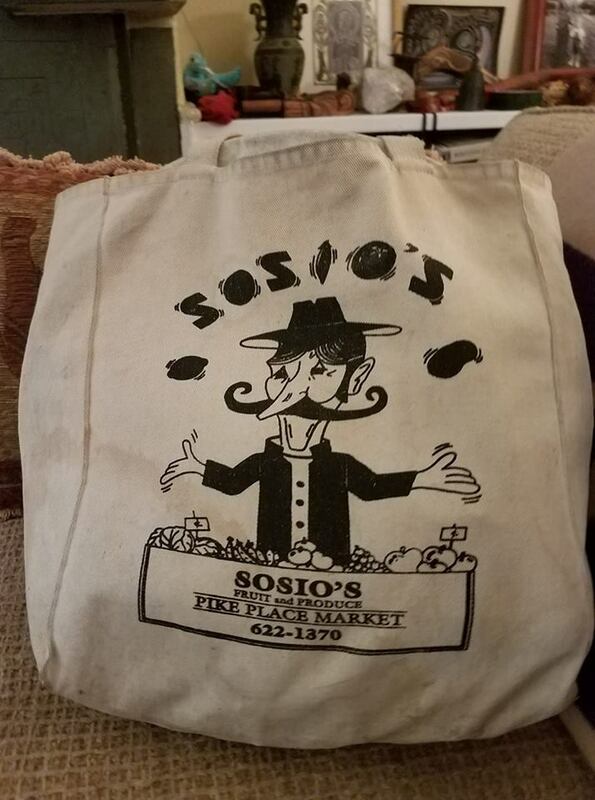 I choose Sosio’s stall, where a sign above the mounds of fruit reads “Oh My God Peaches”. I joke with the vendor that the sign should actually read “Oh My Goddess”. I now exit the market a couple of minutes later than I would have done had I not gone back for the peaches. I am so stunned I don’t immediately recognize the woman in the car. She reminds me, as we move slowly along the street together, that she came to a workshop I led in Seattle five months before. At the time, she and her husband were trying to have a baby through in vitro fertilization. She reminds me that I helped her to journey to meet the soul of the incoming child, and to develop a ritual to add spiritual depth to the medical procedures. She tells me she feels that our work helped. Though she is 45 and her doctors had anticipated difficulties, there have been none; she and her baby are happily on their way. She then told me that she was going to buy two dozen Oh My God Peaches to make peach pies for a very special picnic – a picnic in a cemetery. She and several of her friends had lost close family in a tragic Alaskan Airlines crash a few years before. The survivors had agreed to hold a picnic, as well as a memorial service, to celebrate the dead and the living. As we spoke, I felt the presence of her parents. Her father wanted her to bury a personal item at his gravesite; I received the clear impression of a corkscrew with a twisty wooden handle. I might have felt awkward about passing on the message if synchronicity had not opened our path. She identified the corkscrew immediately; it was a fine one with a vine root handle, one of many her father had collected. Since most his body had vanished underwater, it felt right to lay something more of him in the earth on the occasion of the peachy picnic. Everything that happened around the market that morning was charged with meaning. 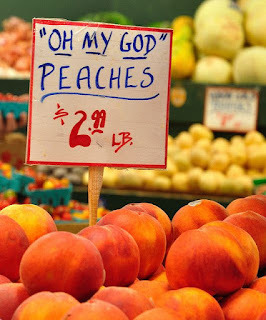 From the moment I bought the Oh My God peaches, I seemed to have stepped out of ordinary time, into a deeper, juicier reality. The mother-to-be and I met because of the peaches, yet I took my walk with no thought of buying any kind of fruit, and the odds on our meeting in that way, with that connection, are beyond astronomical. There were important reasons for us to meet, involving birth and death. But I was unaware of these at the time of our meeting, and had not thought of the mother-to-be since the workshop five months before, while on her side – though she had apparently had fond thoughts of me – she had no inkling that I was visiting her city that morning. Whatever brought us together was operating from far beyond the conscious mind, or any plausible notion of probability. As we enjoyed the shared sense that we had entered the play of larger forces, it seemed entirely natural that her parents should join the party – from the other side of death – to announce their wishes for the peachy picnic before it took place. What is to be said about an episode like this? The first words that come to me are “Thank you.” The mother-to-be and I both felt blessed to have entered a realm of natural magic, where things operate according to dream logic, and the veil between the worlds thins. I carry my drum - the one I use to power shamanic journeys in my workshops - in a bag from Sosio's fruit stand. 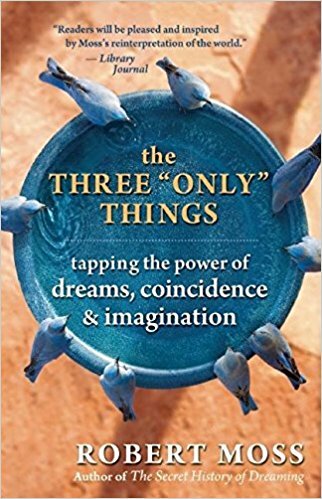 Text adapted from The Three "Only" Things: Tapping the Power of Dreams, Coincidence and Imagination by Robert Moss. Published by New World Library.